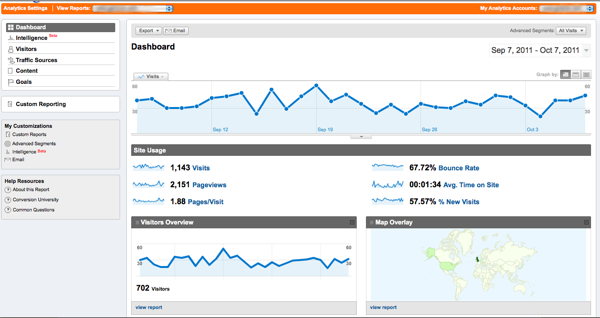 Did You Know That You Can Use Google Analytics with Gallereo? We are pretty big fans of Google Analytics, and for that reason, we've made sure that you, as a Gallereo website user, are able to integrate your own Google Analytics account with your artist website. Google Analytics is a very useful, free tool, that allows you to gather metrics about your website in terms of how many people are visiting, what they're looking at, how they found you and how they have used your website. And those are just the basics! By using Google Analytics you can find out where your website traffic is coming from, which pages are most popular, or which pages are sending people away. You can see which countries, or even cities, your visitors are coming from, and whether they are using search engines to find you or if they have been referred from the likes of Facebook or another site that links to you. A website is nothing without visitors, and it's likely that you have some personal goals for your website, whether that be to let people around the world see your artwork, to advertise your next exhibition in order to get more people through the doors, or whether you want to sell your artwork online. Without an understanding of how people are using your website, it's impossible to know whether you are reaching those goals, or to work out what you could do to move closer towards your goals. If you just want to grow the audience for your work, then knowing your traffic levels and time spent on your website might be enough. You want a high level of traffic, but a low bounce rate, as you want them to actually spend time looking at your site, not just to click away within a couple of seconds. If you want to advertise your exhibition and have created targeted information on you website, you might want to set a goal in your Google Analytics admin so say you want to drive people to that particular page on your site. You can then track stats for that individual page, as well as learning where people are coming from when they view that page. If you're looking to sell artwork, you can again set up goals with Google Analytics where you can create a funnel of steps that you want people to perform. Each of the steps would take a user closer to making a purchase, so you would have the artwork page, the cart page, then each step down the shopping cart, with the confirmation page as the goal. You would then be able to see how many people had attempted to buy, how far they got through the funnel, and perhaps what has stopped them from completing the transaction. How Do I Set it Up and Integrate? Setting up and using an account is free, so to get started go to http://www.google.com/analytics/. On the introductory page, click the sign up button and sign up for a Google account if you don't already have one. 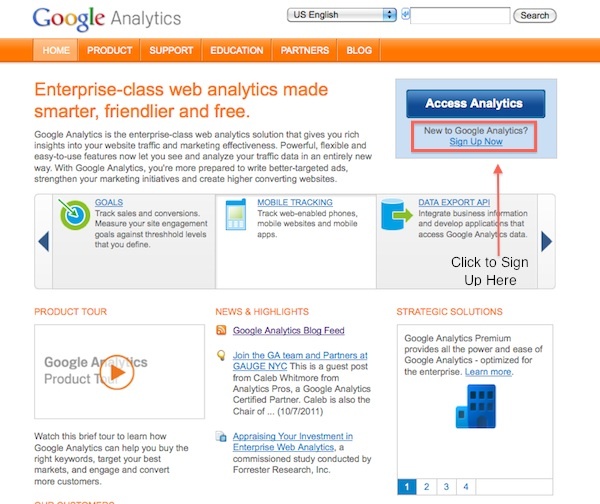 If you do already have one, you will be able to assign that to Google Analytics. Once into Google Analytics you need to create a new account, so give your account a name, and then enter your website URL. Make sure that the time zone is correct and then set your data share settings to suit your preferences before choosing your region again for the user agreement. Tick to agree with the terms and conditions at the bottom of the page, and click to create your account. 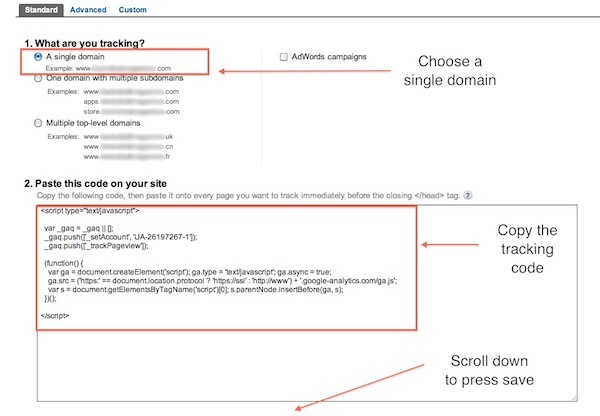 On the next page you will be asked to confirm some details about the tracking in order to create a tracking code, and in most cases tracking for a single domain will be fine, so select that and then copy the code that you are given in the box at the bottom of the page. Now open you Gallereo website admin, and go to the configuration menu. Here you will see a section for Google Analytics. Open that section and past the full code into the box. Back in Google Analytics you can press save at the bottom of the page which will take you to through to your dashboard area where you will later start seeing results from your website. Note that it can take 24 hours for Google Analytics to find the code on your website and start pulling in results so don't panic if you don't see something straight away. Now that you're all set up, you can sit back and anaylise your website traffic until your heart's content.